All associates are invited to participate in the selection process for the new Editor-in-Chief of the International Brazilian Journal of Urology, according to the process defined in articles 12.2.1, 12.2.2, 12.2.2.1, 12.2.2.2 and 12.2.2.3, of the internal regiment of the Society. Candidates should apply from this date to June, 1st, 2019, by sending an email to the International Brazilian Journal of Urology (brazjurol@brazjurol.com.br), with the following attached documents: (i) curriculum vitae; (ii) a list of features that qualifies the candidate for the job; (iii) list of projects that would like to implement in IBJU during the four years of term of office; the email for inscription (subject) must contain the phrase: “candidate for Editor-in-Chief Int. Braz. J. Urol.”. BSU board of directors will propose an Examination Board that will analyze the documents, and the qualified candidates will be summoned by email for an interview with the Examination Board in a determined place, date and time during the Brazilian Congress of Urology 2019. Once concluded the selection process of the qualified candidates, the Examination Board will announce the winning candidate, based on the submitted documents and interview. The new Editor-in-Chief will be announced at the final ceremony of the Brazilian Congress. The elected Editor-in-Chief will participate in the daily activities of the current Editor, aiding with the elaboration of editions 05 and 06 of 2019 of IBJU, and will posteriorly be in charge of the new editions from January 1st, 2020.
g. List projects that pretends to implement at IBJU during term of office. Rio de Janeiro, February 21st, 2019. This is the first issue of 2019, a special year for International Brazilian Journal of Urology. It will complete 45 years of uninterrupted publication of our magazine. 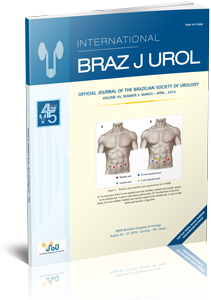 This is a landmark, since Int Braz J Urol is a journal always supported by the Brazilian Society of Urology, without the aid of any other publishing company. Also, this is an open access journal that has never charged the authors for any publishing fee. One of my distinct honors as the editor of the video section is to reflect on the prior year and to highlight some of our major accomplishments and contributions, with once again our submitting authors highlighting the incredible surgical talents and innovation being adopted across the world. In this regard, I am pleased to once again share with you the selection of the three best videos of the year, with the criteria for selection being the accepted videos that most vividly depict the creative approaches to surgery within our field, with the ultimate goal of optimizing patient related outcomes. In this regard, I am pleased to announce the 1st prize selection being the video by Luciano Favorito et al. from the Hospital Federal de Lagoa in Rio de Janeiro, Brazil entitled “Double inlay plus ventral onlay buccal mucosa graft for simultaneous penile and bulbar urethral stricture” (available at. https://www.intbrazjurol.com.br/pdf/vol44n04/Favorito_838_839.pdf). The third prize goes to the video entitled “Laparoscopic partial nephrectomy for multiple (four) tumors” by Lessandro Curcio et al. from the Hospital Federal Ipanema in Brazil, published in the May-June issue (43(3): 567) (1) of our Journal. The authors nicely depict in this video a two-stage approach to managing a patient with multifocal renal tumors using a minimally invasive laparoscopic approach in which the larger tumors were approached in na initial setting using a conventional clamp technique, followed by which the two smaller ones were approach in a non-clamped manner. This video nicely depicts that each case must be approached in a personalized fashion with the individual tumor characteristics, multifocality, and location aiding in the selection of the most suitable surgical strategy, including appropriateness of minimally invasive and clamp versus non-clamp vascular hilar control techniques. Peer review system is like democracy: it is absolutely imperfect, but the best available. It allows criticism to articles, suggestions for improvement under different perspectives and allows the editor to make a fairer decision about the future of the article. 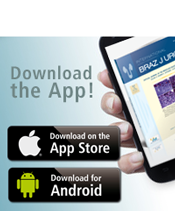 The reviser is the soul of a medical journal like International Brazilian Journal of Urology. He/she dictates the quality of publishing, the velocity by which each article reaches the reader, being a voluntary job that takes time. A good reviser is rapidly identified by different magazines and is overloaded by many requests. A good reviser is not necessarily famous in his/hers specialty, but a dedicated person that spends precious time without payment in order to evaluate a paper and to decide if its valuable enough to be published or if it needs improvements and guidance to authors. International Brazilian Journal of Urology has received 641 new submissions in 2016, added to other 275 that were revised and resubmitted. 456 revisers participated in that task and it is important to nominate, as we have been doing in the past years, the most efficient and more collaborative. Al of them evaluated at least 10 papers in 2016 and took 2 to 6 days to perform the revision. This effort and the agility of the Associated Editors allowed a median time of 54.2 days from submission to final decision for publishing, with an acceptance rate of 27.1%. With the update of the journal website (www.intbrazjurol.com.br) and the policy of publication on line (Ahead of Print) quite fast of the accepted papers, today it is possible to have a paper published at International Brazilian Journal of Urology and consequently at Medline in a median time of 90 days following submission. Another novelty of the website (very important to Brazilian authors and urologists) is the possibility to access on line all editions in full of the old Brazilian Journal of Urology, since number 1, 1974. The International Brazilian Journal of Urology is totally costed by Brazilian Society of Urology and all publishing production is made by regularly employed officials at the Society headquarters. The joint effort of Ricardo de Morais, Technical Editor, Bruno Nogueira, Production Editor and Patricia Gomes, Secretary, has made our Journal more interactive and more competitive over the years. It is our pleasure to announce that The International Brazilian Journal of Urology has been included on The Urology Green List. This site (https://urologygreenlist.wordpress.com) has been created to be a reference to assist urology researchers to know which journals are safe to publish in. It is a protection to the investigators against invitations from predators journals and publishers. We thank to and congratulate Professor Henry Woo for this initiative.